For home PC users who are searching for freeware spyware and adware removal tool with complete features, Spybot 2.0 is the world-class product in detecting and removing dangerous programs, especially malware-related threats. It can detect and destroy spyware, adware, keyloggers, Trojans and many other malicious programs which are not easy to remove. 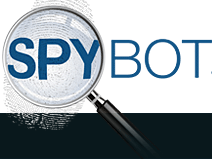 As Spybot 1.6 is still in use, the stable version 2.0 is also available for download which is compatible with all Windows OS versions. The new version has some advanced features which would make your PC protected comprehensively. The installation part is quite easy and no toolbars are installed on your default browsers. As far Interface is concerned, Spybot 2.0 has a new look compared to the previous version. All the basic tools, advanced tools, and professional tools are placed in the main interface itself for easy and faster access. 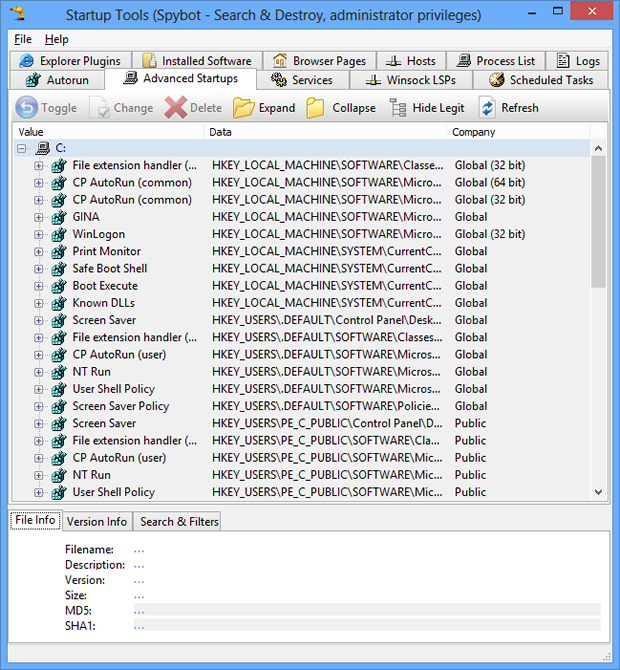 When you select any tool, it takes you to different module with the related tasks on the left-side similar to Windows Explorer. The scanning module has to be the key and it perfectly analyzes your PC for malicious programs and malware-threats. When running the full scan, Spybot consumes more system resources than other spyware removers. This could be a problem if your PC does not have sufficient RAM or hard disk space. You would require minimum 512 MB RAM and 300 MB free hard disk space. For handling huge folders, you can now use Separate File Scanner. Faster Scanning compared to prior version. New Protected Repair Environment helps you to run Spybot in an isolated and secure desktop. Improved white-listing identification for File Scanner and Startup Tools. A Professional Edition Test License which is valid for 2 months. Fixes malware, Rootkits, Trojans, ActiveX objects, browser hijackers, trackerware, keyloggers and many other malicious threats. Find and Delete tracking cookies on your PC while browsing internet. PC Immunization – Block malware-threats before they infect your computer by using some preventive steps. You can also scan iPhone profile and remove programs which are vulnerable and not compatible. 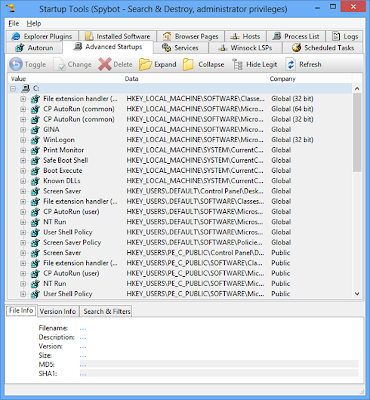 Startup Tools – To fix any softwares or programs which are not necessary and compatible with your PC. Repairs and backs up your registry items if needed. Secure Shredder – Safely removes or wipes out your PC hard disk completely making it unrecoverable. Follows OpenSBI rules for detecting and destroying malware and spyware. Boot CD Creator – Make bootable CD with Spybot installed on it because sometimes boot CD acts as a medium to inject spyware or malware onto the computer. Whitelisting – Making a list of secure programs which are to be used and the rest will be skipped or not executed. You can integrate the Windows Security Center with Spybot and have an extra layer of protection. Frequent updates of latest virus definitions. Spybot 2.0 is worth trying in detecting and disinfecting malware in real-time. The “Free” edition is available for download of lifetime license with all necessary protection tools which are to be done manually. If you want to automate the scanning, fixing or immunizing without your intervention, you have to buy the “HOME” edition. The “PRO” version is also available which has advanced features like Protected Repair Environment, Boot CD Creator and Command Line Tools that are not present in Free edition.